While storm chasing with Tony Laubach the night prior, I received a text from Michael Carlson asking me if I'd like to join him for a chase the next day. After some consideration and a look at the forecast, I accepted his invitation. With a deep trough across Ontario that flattened out through the Ohio Valley in the east, a relatively cut off upper level low sat off the west coast. Models had a shortwave crossing the Great Basin that evening and entering the Rockies over the course of the day on the 16th. 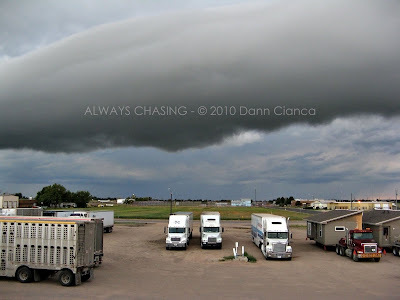 This, with potent monsoon moisture advecting into Colorado gave us a high chance of thunderstorms. 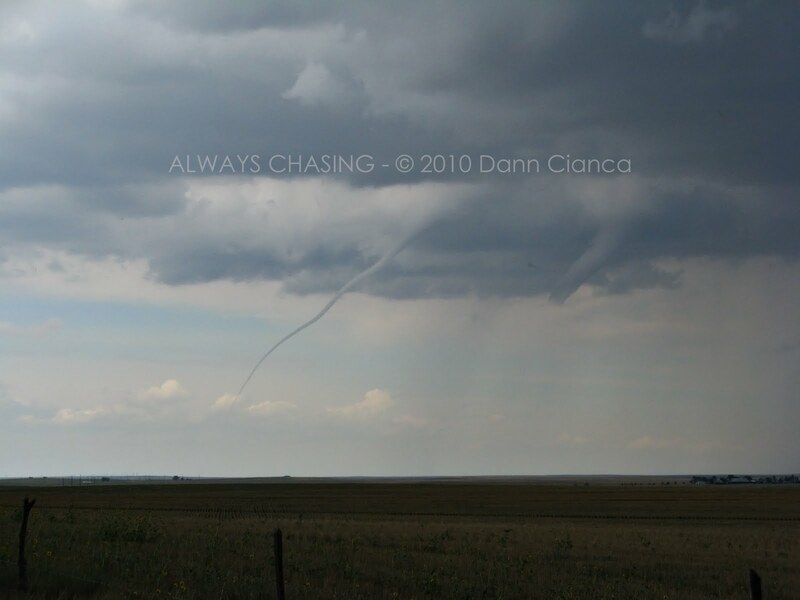 This time of year is generally a good time to see a landspout, with zonal flow and quite a few Denver Cyclone/Denver Convergence & Vorticity Zone days. 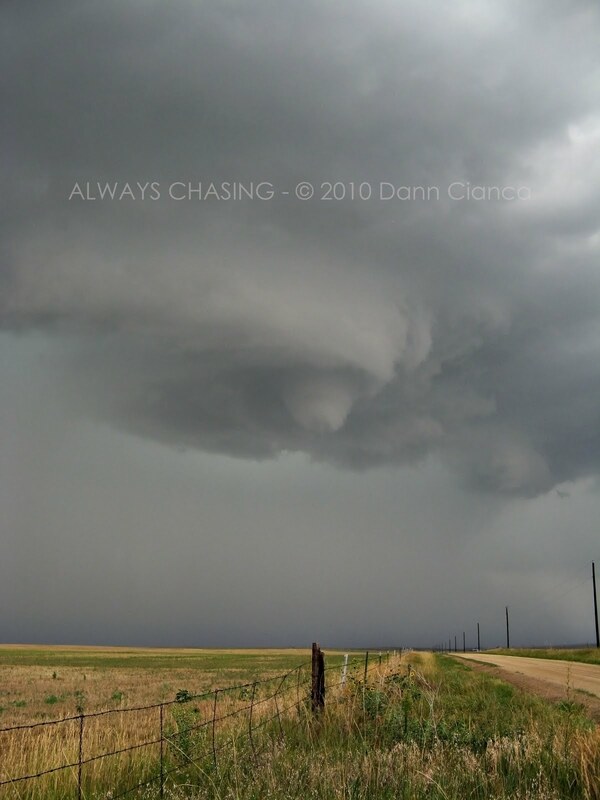 Generally, I keep my eyes open for non-supercellular tornadoes on the boundaries. 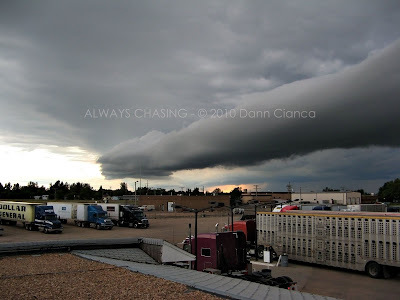 Considering that the day prior saw a stationary convergence boundary southeast of the Denver Cyclone, I was hoping for a repeat on the 16th, especially with the upper level energy coming through. That morning, both low clouds and cirrus painted a difficult picture for the forecast. Michael had a feeling about Wyoming and considering his luck up there, I couldn't blame him. Unfortunately, cloudcover was thick and most of the obs carried low visibilities. 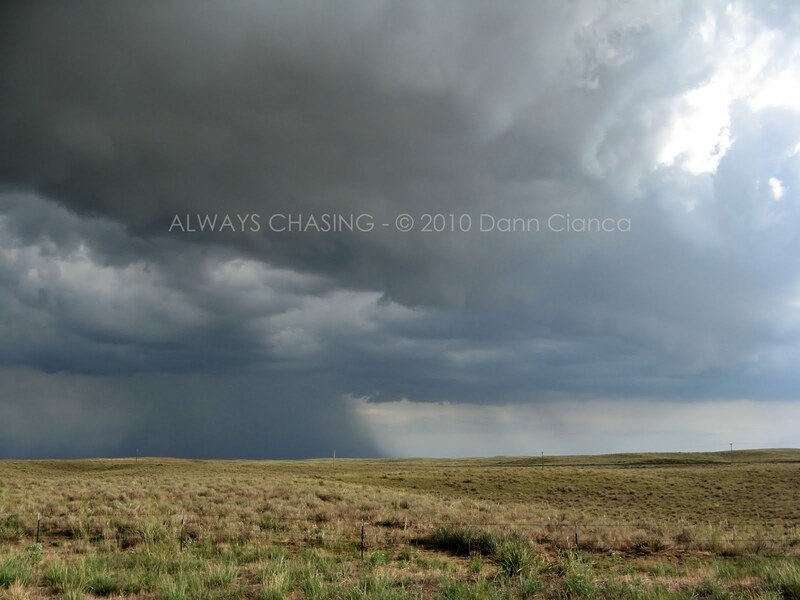 There were a few thunderstorms near Douglass, but northerly winds throughout southeast Wyoming weren't that alluring to us. 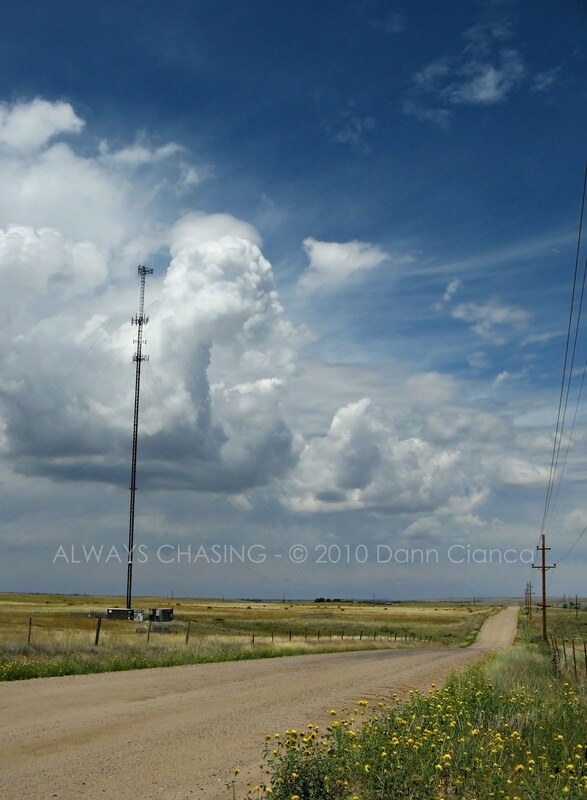 Topping off the Wyoming play, was the out-of-commission Cheyenne radar. 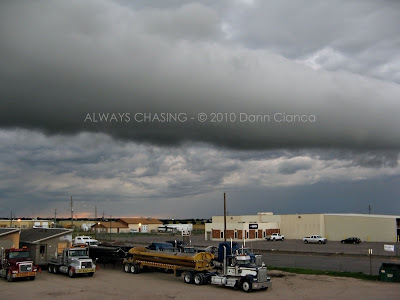 If it were a day of high visibility with isolated storms expected, that wouldn't be a problem, but with lots of cloudcover, staying visual would have been difficult. This was the nail in the Wyoming coffin. The forecast for Colorado wasn't much easier. Cloudcover would play a key roll in storm coverage and intensity during the day. Already that morning, a line of weak thunder was rolling off the Footies. 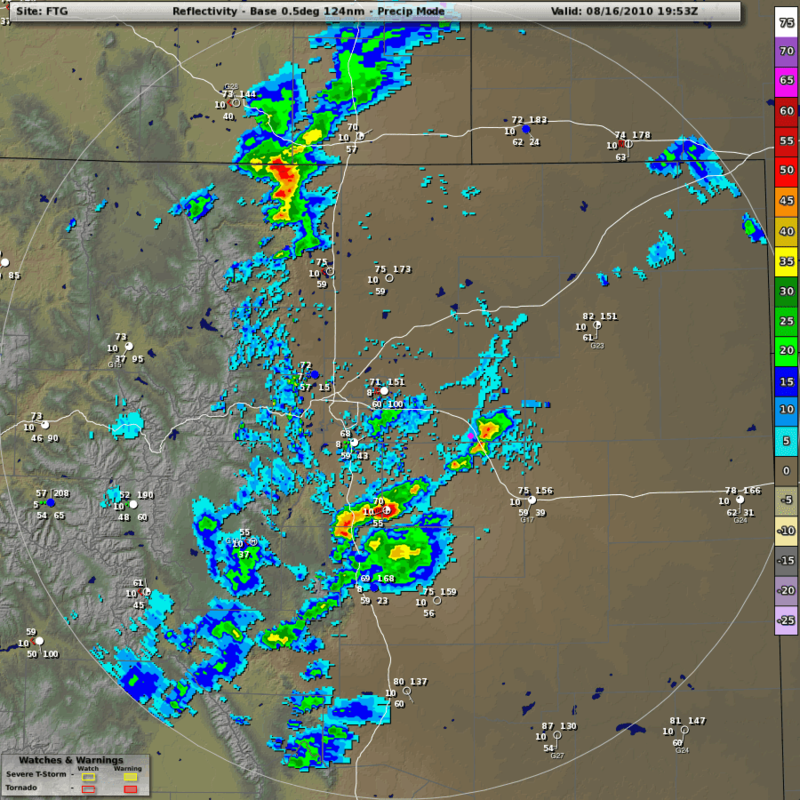 The stationary boundary from the day before was slowly moving southeast toward Limon. Visible satellite, however, did show that there was some clearing on the Palmer Divide. Limon was warming nicely, unlike the day before, where cloudcover kept the temperatures down (and subsequently kept the cap from breaking downstream east of Denver). 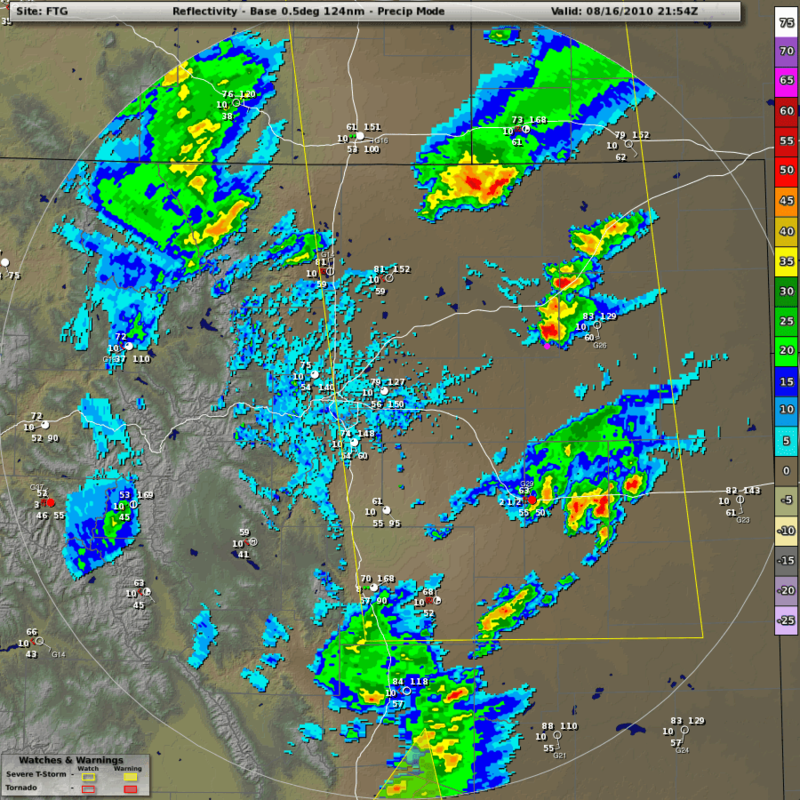 Southeasterly winds of 20kts or so blew in the Limon area, helping bring rich moisture into the area. The better upper level energy would pass to the north and it appeared that the Akron area, via the models, looked the best for supercells later in the day. I had my eyes on the clearing on the Palmer, however and was hoping that the strong southeasterlies would stall the boundary. That was the name of the game for the day... find the sunshine and find a boundary. Here was SPC's Convective Outlook for the day. I met Michael and Kendell LaRoche (or The Great/Inspector Larouche as I like to call him) at the park-and-ride east of town. 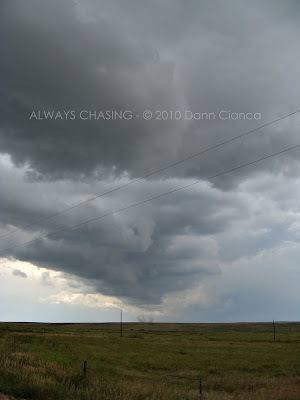 We set out on I-70, eastbound, planning on heading out to the boundary, which sure enough, was beginning to stall out. 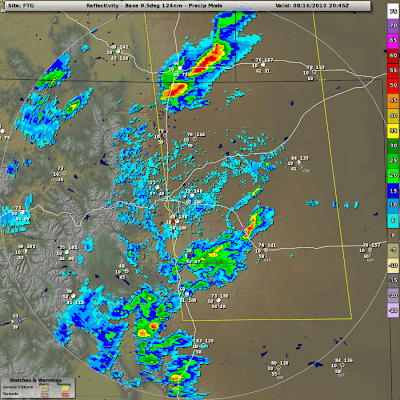 The weak thunder that had rolled off the mountains was slowly moving east, but not strengthening. The sun was starting to break through the clouds as we made our way toward Deer Trail. 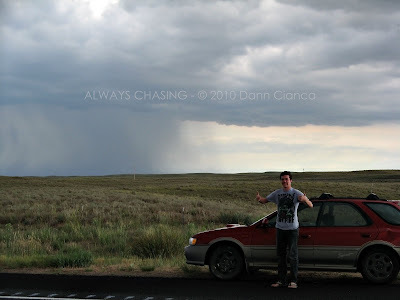 We got off the highway and stationed ourselves on higher ground southwest of town, just a bit to the east of the convergence line which had now stalled. 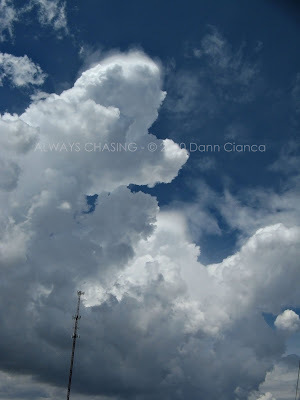 Cumulus towers were slowly growing larger with the day's heating, aided by the moist southeasterly winds. 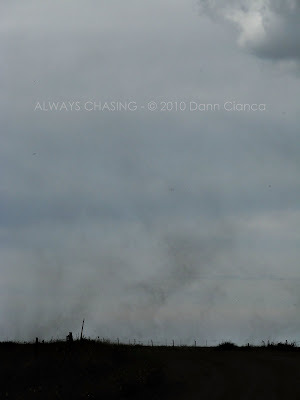 We studied the sky there for almost an hour, watching the occasional dust devil directly under the growing towers. I knew that was a good sign. We kept a close eye on the horizon in front of us as the towers began to mature and a Mesoscale Discussion (#1702) was issued. 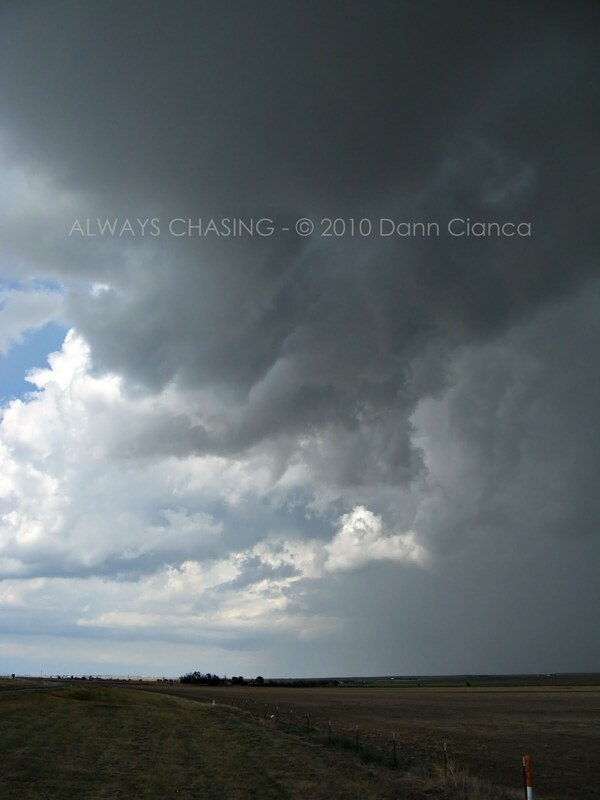 The strongest updraft was immediately to our north and started releasing some precip which was carried east. Towers matured from a north-northeast to south-southwest fashion along the line, which curved along the south side of the Palmer Divide into the Colorado Springs area. 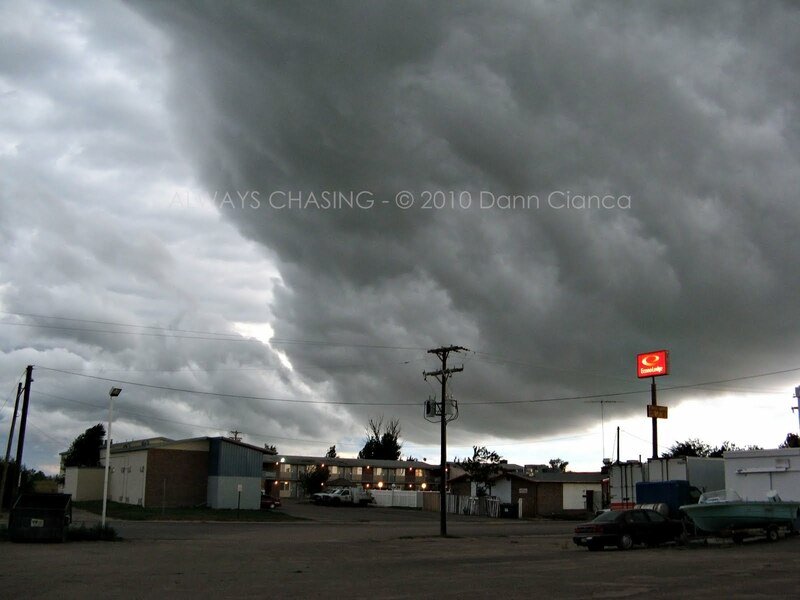 We decided to head south on Bartlett Road and keep up with the maturing storms as the northern storm had already begun to weaken. 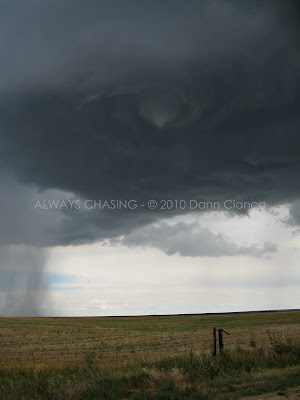 Just a mile or two down the road, Kendell spotted a large, dusty ground circulation to our south. 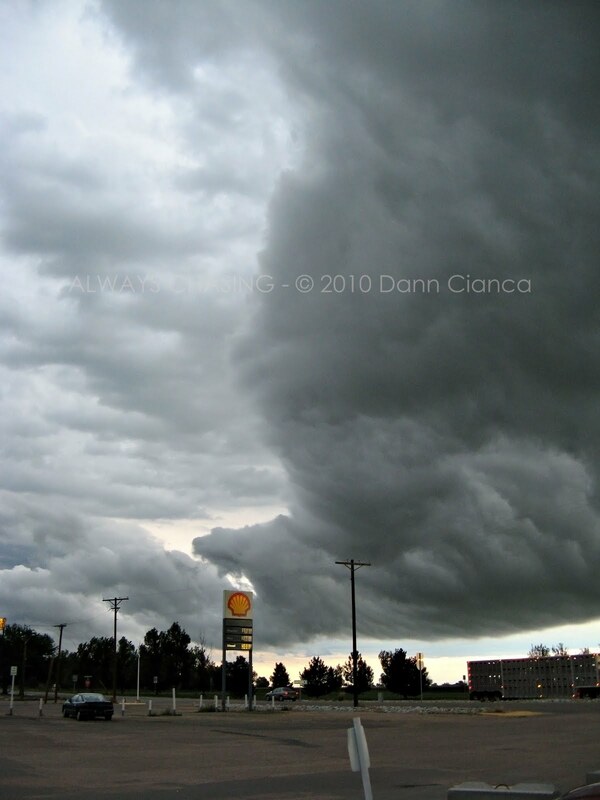 Being in the backseat, I was unable to discern rotation in the cloudbase above, but Michael said that there did seem to be some rotation there. As we approached, it dissipated. I was able to grab one frame as we got close. We continued south on the road and soon found ourselves dancing with lofted tumbleweeds. Through there didn't seem to be any significant amount of dust in the air, there were tumbleweeds floating around as high as 200ft into the air. There was a lot of lift along this line. At this point, we decided to turn around and head back north along the road. 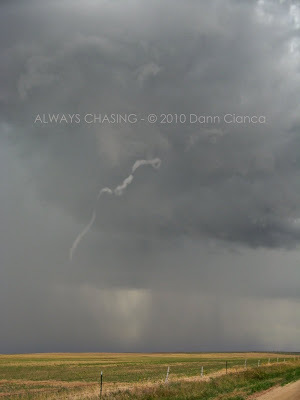 To our surprise, dominating our view was a long, skinny funnel cloud which was a few miles to the north. 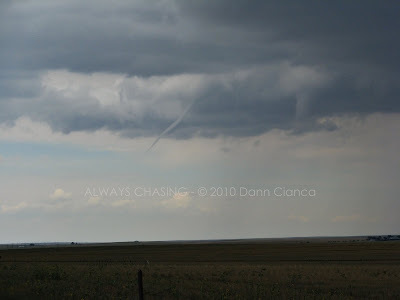 Another, stout funnel cloud came out of the base to its right. 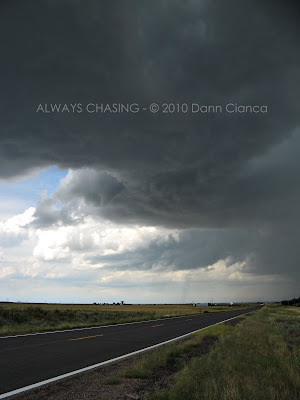 On top of that, another large, dusty ground circulation was right in front of us, on the left side of the road (as we drove north). Tumbleweeds were being lofted all over the place (as can be seen in detail in the photo below... click for a larger version). We sat and watched the two funnels for a while. One appeared quite close to the ground. Scott Hammel reported as a tornado near Deer Trail at 1955Z as he had been very close to the ground circulation. 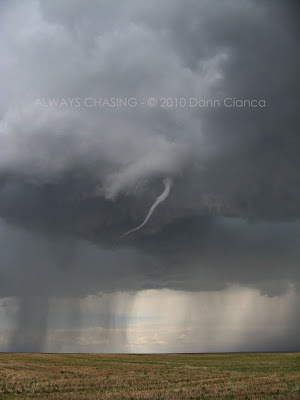 The other funnel never really seemed to descend too far. As they dissipated, we turned our attention to the updraft just to our east. Surprise! Kendell stares into the whirlpool. 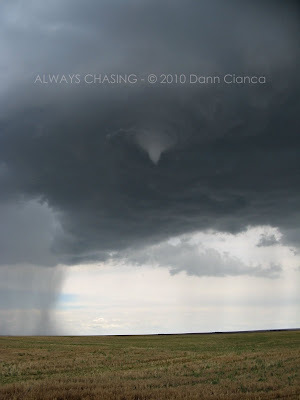 As we watched, a small cone funnel began to develop in the center. 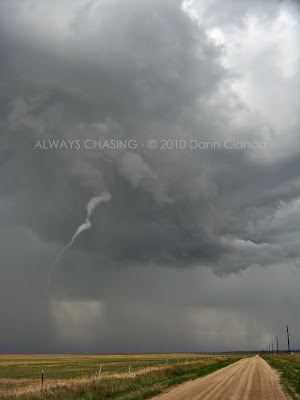 A glance to the south, along the line revealed another whirlpool to our south and a funnel cloud south of that! The question soon became: What does one point their camera at? 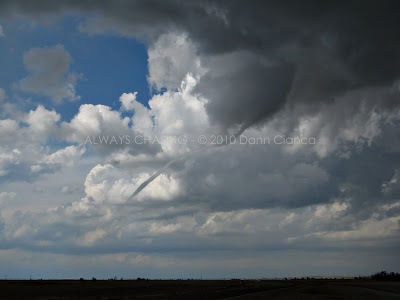 ... and the southern funnel melt away. The middle circulation, however, became the largest of them all! Looking back to the northern funnel, we see it at its longest condensed length. Back to the middle circulation and suddenly, wham! 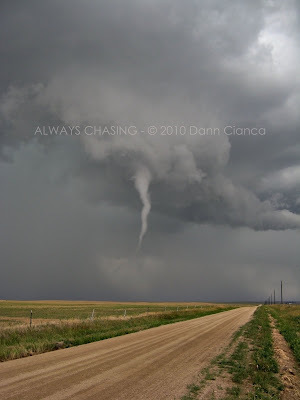 We're looking at a tornado! 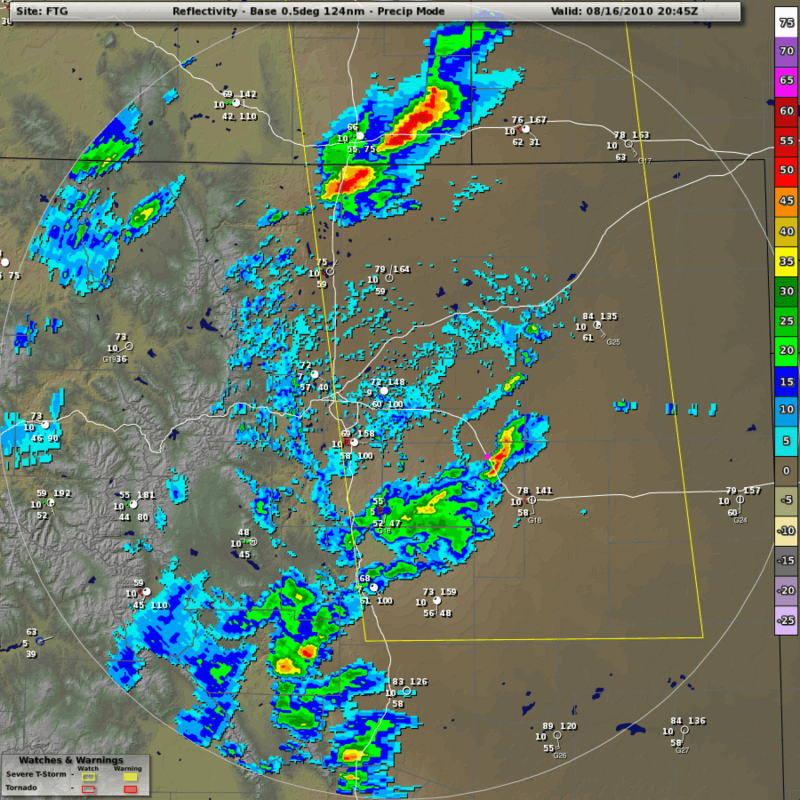 Touchdown likely in the Keg Creek drainage, 6WNW Agate at 2012Z. As the line pressed east and left the boundary, it began to lose some steam. 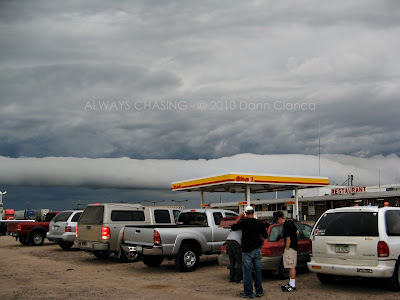 We decided to head south and then east to get back to I-70 at Agate and at about that time, we ran into Tony Laubach. We stopped to talk to him for a moment after deciding to head north, where new cells were beginning to sprout along the convergence line between Brush and Last Chance. 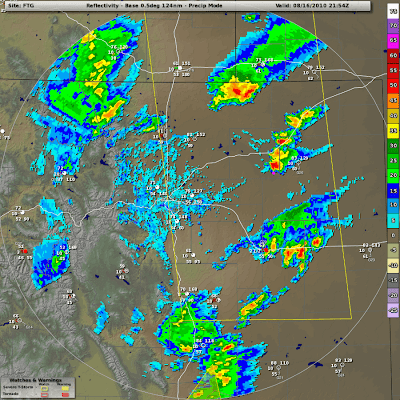 (as detailed in the reflectivity image below) Also at this time, Severe Thunderstorm Watch #622 was issued. 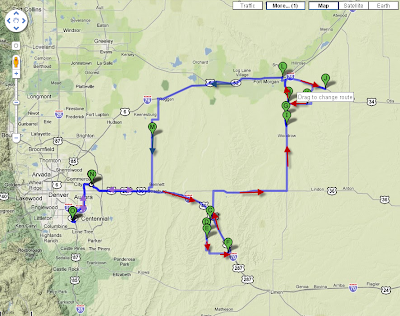 We blasted north to through Deer Trail and took a shortcut to US36 where we headed east for Last Chance. 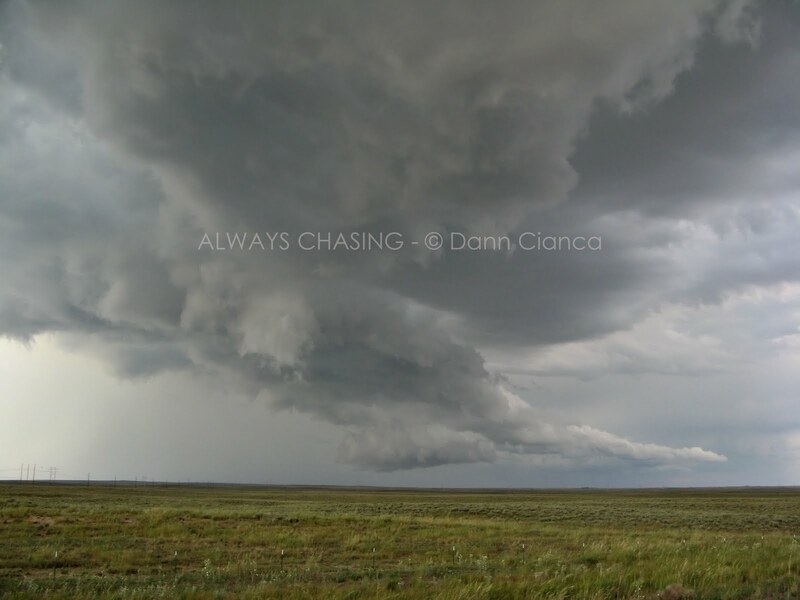 Michael noted that the storms weren't moving off the boundary, so we decided to intercept along CO71. 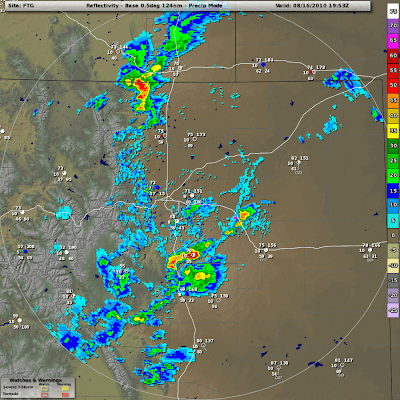 The southern storms died off, but a storm just south of Brush began to attain supercell characteristics. From our vantage driving northbound (not shown), the main tower had a bit of a tilt and was slightly striated with a flanking line of towers heading due west. 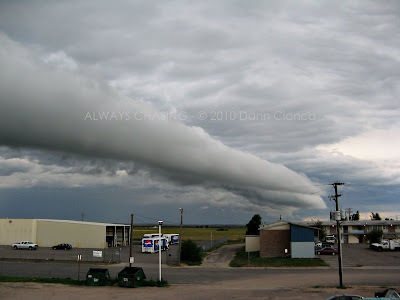 This line marked another convergence line, oriented east-west, which was coincident with the north-south boundary at the storm's updraft region. As we arrived, the storm was warned for hail and wind and here was our view directly under the weak mesocyclone. 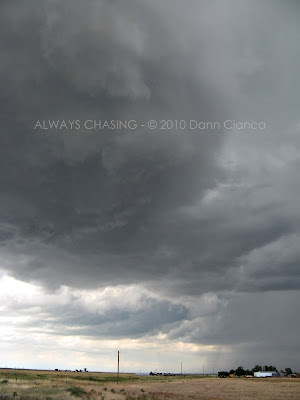 Tony had followed us up and had gone north for hail, so we just sat and watched the base slowly rotate for a while. Eventually, there appeared to be a bit of a rear flank downdraft cutting through the back side and moments later, a funnel appeared! 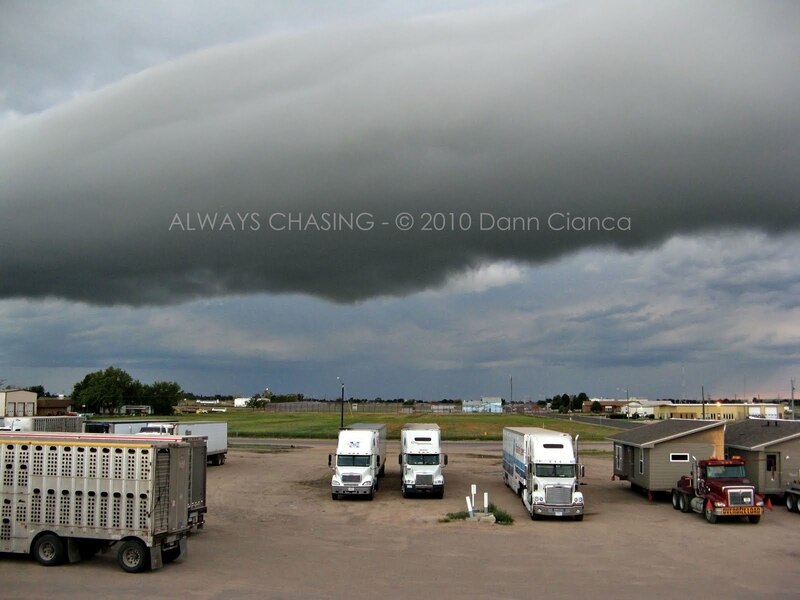 Interestingly, no wall cloud was present. 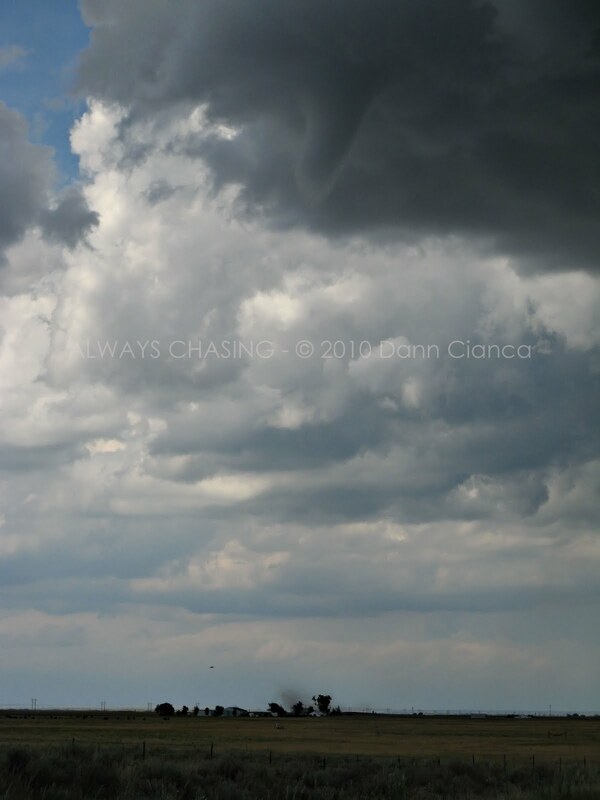 I ran over to the highway to get a better view as the funnel developed. 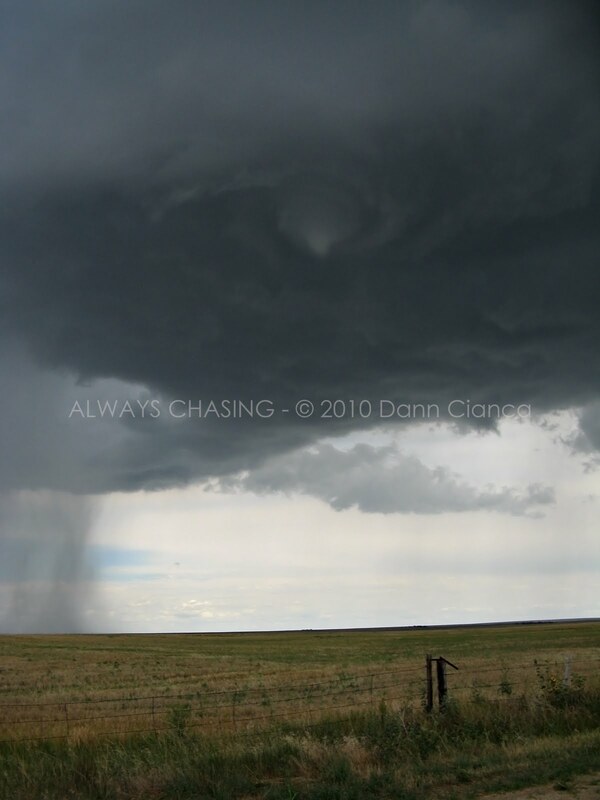 This time, there was a easily visible, directly associated ground circulation, which was noticed at 2153Z. 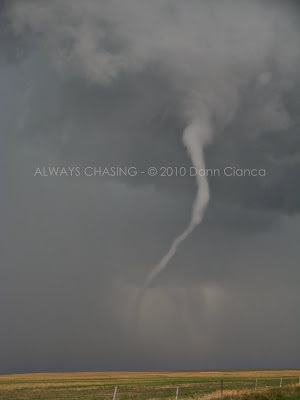 We watched for a while as this tornado developed. 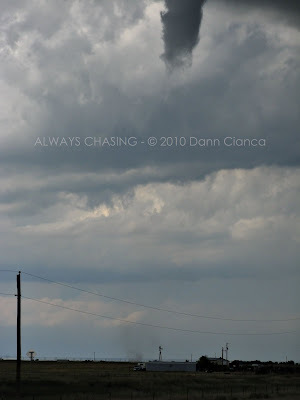 As we were watching it dissipate, another funnel was plainly evident... and in the photo, I can see at least one more! What a crazy day! Scott pulled up at about this time and Tony informed us of a structural impact up north, so we decided to go check it out. Heading north, Michael saw someone pointing to the south and he turned to see another long, beautiful funnel cloud. I turned around and saw it and tried to get Scott's attention. We pulled off into a driveway and this is what we saw, obviously on the ground at 2214Z. 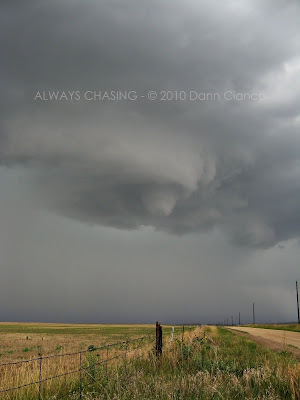 Somehow, we had passed under this developing tornado without noticing, though the ground circulation stayed east of the road. 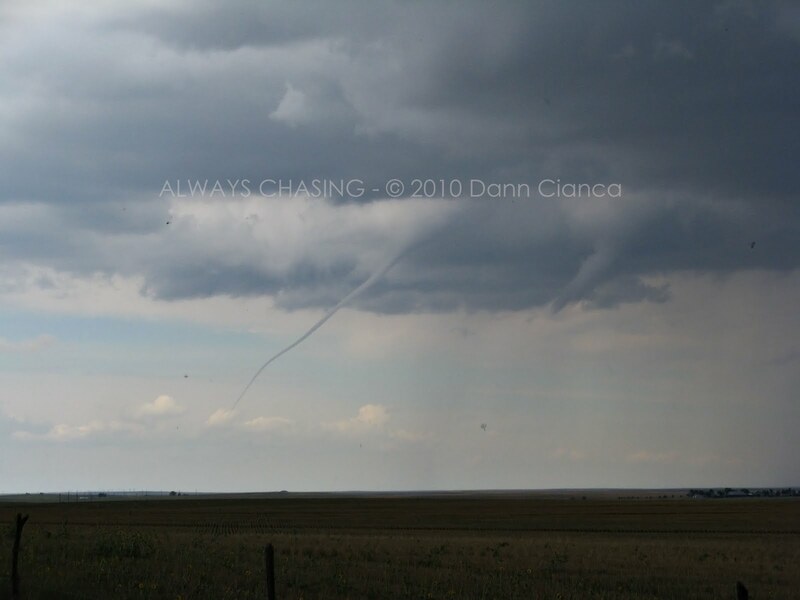 In fact, its ground circulation was very close to that of the previous tornado and less than a mile to the west of Ninemile Corner. We ran into Zach Young at this juncture as well. 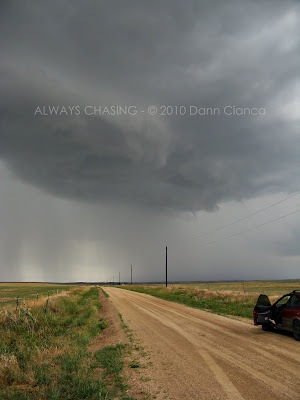 Before the tornado lifted, we got back in the car and headed south to get a bit closer, but it dissipated. We saw Eric Treece, Mark Farnik, Sean Mullins and Ben Toms all there as well. I was glad to see all of the Colorado chasers out there! We stayed south of the storm for a few minutes, monitoring it, while everyone else headed north to a supercell that had rolled off of the Cheyenne Ridge. We didn't want to leave this storm! 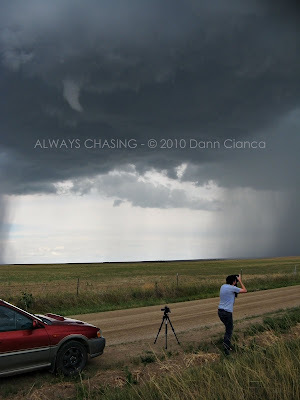 In fact, we did see one more funnel (not pictured) before the reflectivity really started dying off. 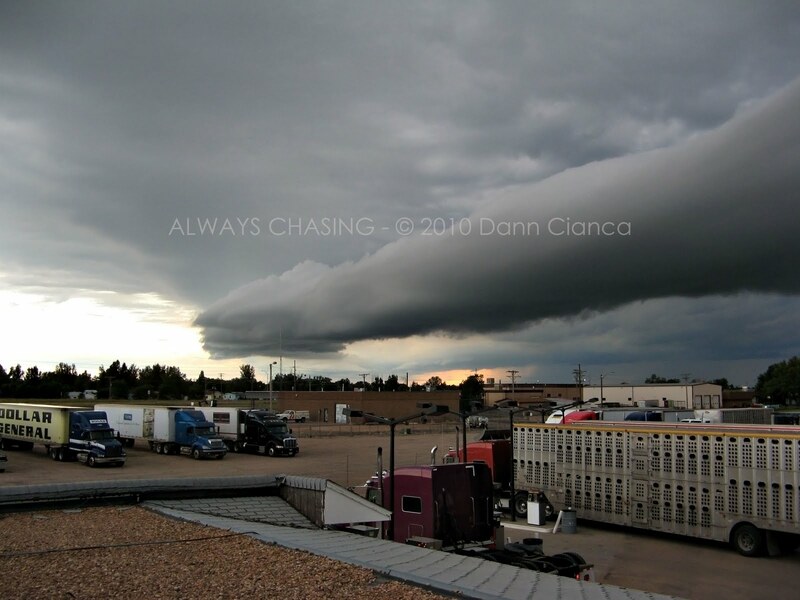 The supercell up north came crashing into a boundary along I-76, which had previously fired storms. Its forward momentum basically carried it into the line like a plow, undercutting it. The entire area had a brief explosion of outflow cloud before most of the updrafts collapsed. We had a close look at this line just east of Brush. Michael was in a good mood. As the line gusted out, we noticed that our tornado-maker to the south had intensified again, so we did a little loop through the sand hills to take a look. 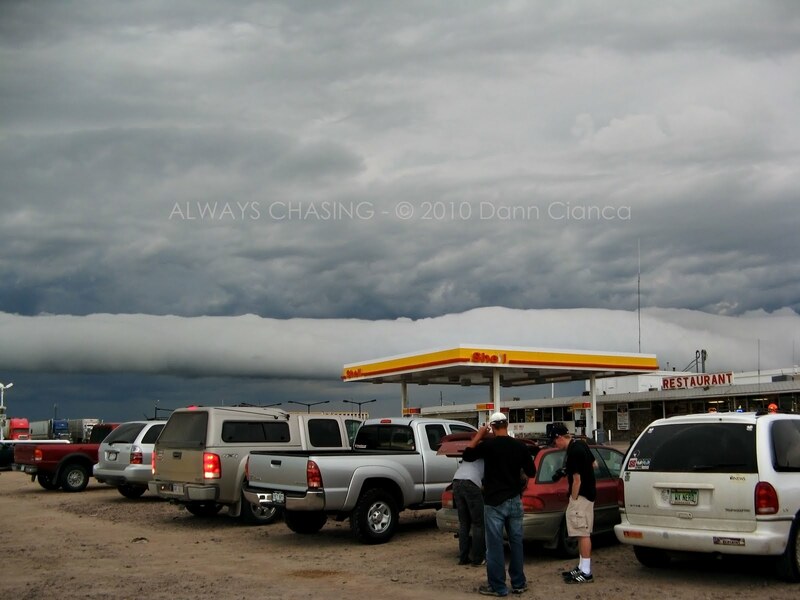 But alas, it was done, so we met Eric and Tony as well as other Colorado boys Travis Speakman, Jason Groenhoff and Dustin Price at the Tomahawk Truck Stop in Brush for a celebratory steak dinner while another MD (#1706) was issued concerning the watch. We were satisfied, however, and enjoyed our dinner! 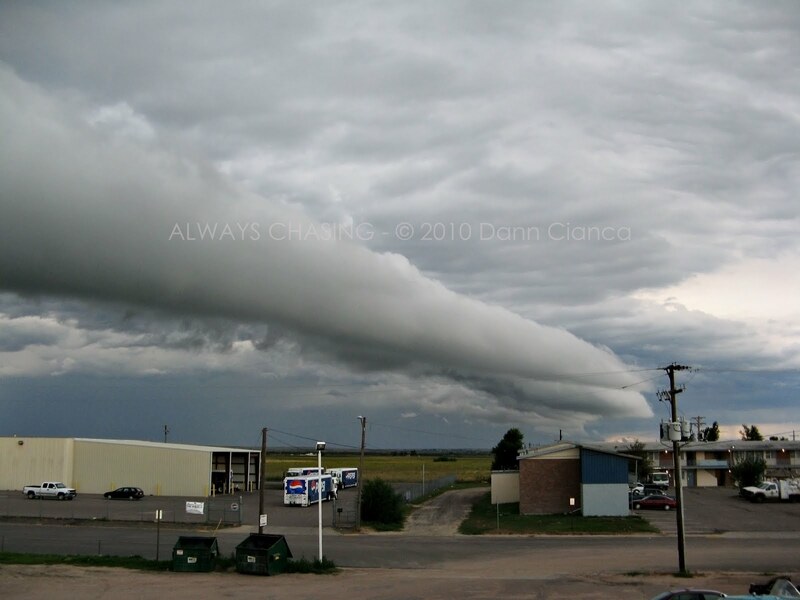 When we left, a fantastic arcus cloud dominated the western horizon! 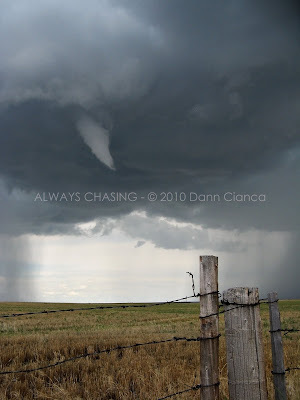 ... but it passed by with little fanfare. The quick trip back to Denver was more of a victory lap than anything. We even got a nice sunset as a present as we drove through a dying line of storms. All in all, it was a great day. We achieved quite a bit of success on the day. First of all, though the forecast was a bit tough that morning, both of our targets verified. That always feels good! 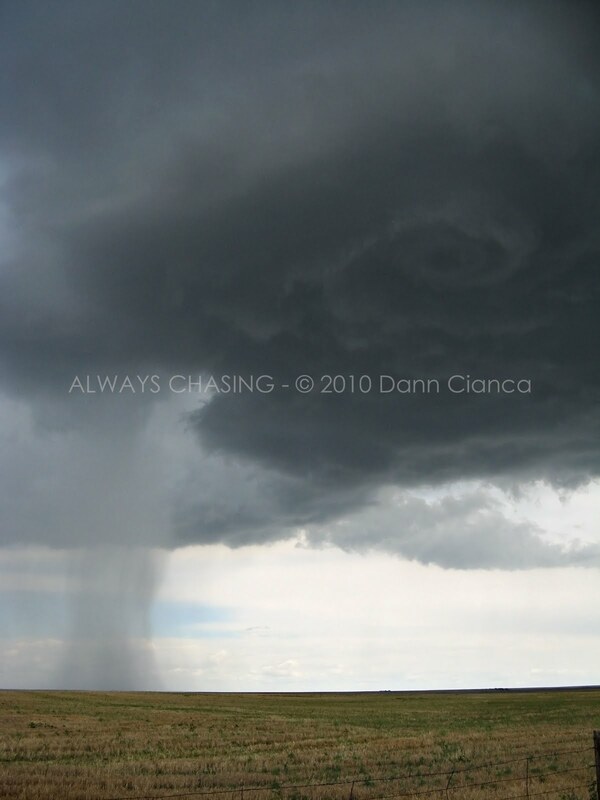 ... and the timing couldn't have been more perfect! 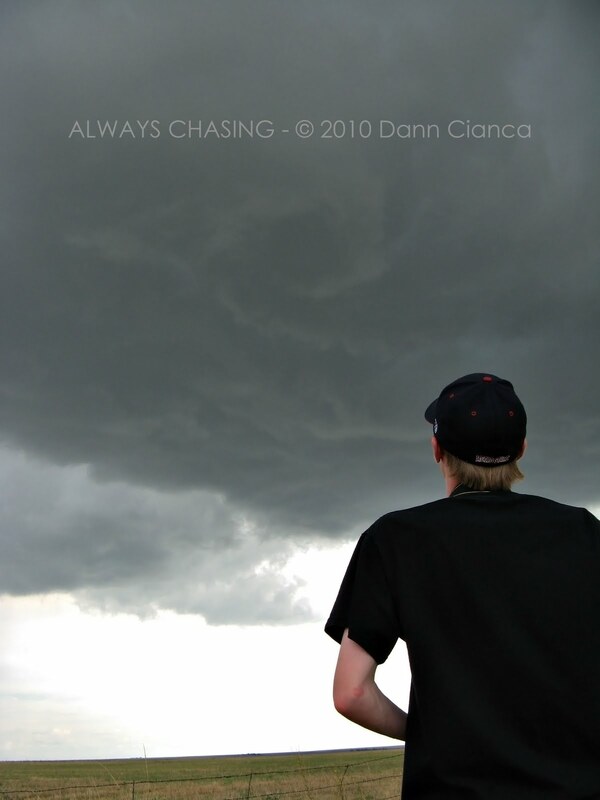 Secondly, it was a great day for all of the Colorado chasers out there! We didn't seem to have any foreign invaders getting *extreme*up*close* footage of the tornadoes. On an interesting note, the first couple of tornadoes were definitely non-supercellular, but the final two were a more interesting case. While the final two tornadoes would likely not have formed if it weren't for the boundary interaction at the time, I do believe the storm's weak mesocyclonic structure did aid in tornadogenesis. 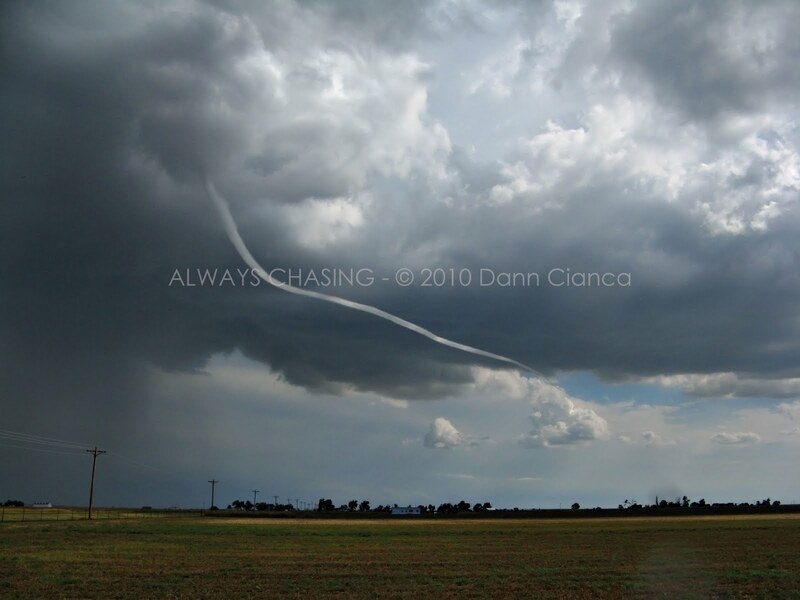 Unless, of course, that the "cut" was not true RFD and simply a product of the vorticity of the stretched vortex from the boundary. Officially, I feel that it is a hybrid tornado, but would listen to an argument to the contrary. 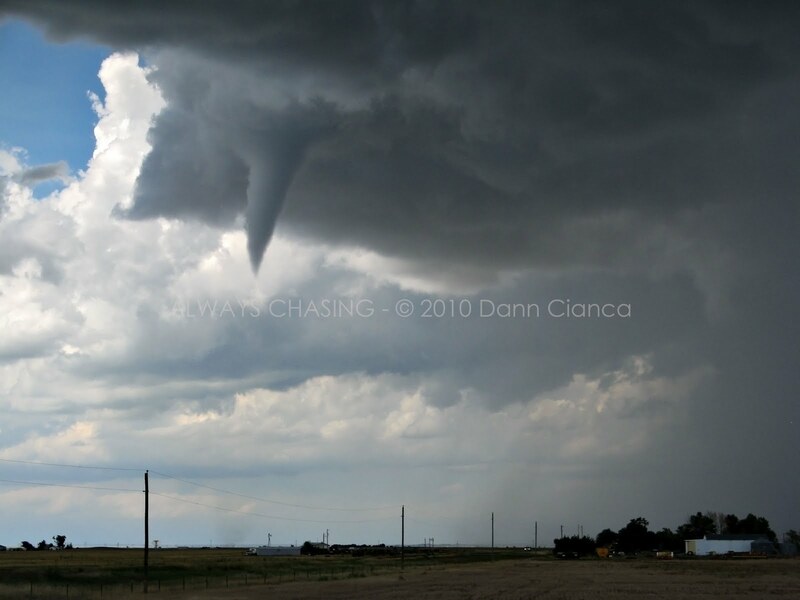 Note: No injuries were reported with the first Ninemile tornado, though it did destroy an outbuilding. A horse was unfortunately injured and had to be put down a short time later. It is worth mentioning that the outbuilding had been rebuilt after being destroyed from a wind storm earlier in the year. Video to be added at a later date. Official storm reports for August 16th. That long white rope is AWESOME! What a day for you guys! Fantastic right up and photos dude...I remeber crying this day as Michael asked me to go and I declined because of work. I'm still crying. Don't cry for me, Eric Haave.